SaveInShop Ads might start appearing on your screen if you have SaveInShop application on the system. This program does not differ much from SavinShop; thus, if you have ever encountered it, you will definitely know what to expect from SaveInShop itself. Unfortunately, this software is nothing more than just an advertising-supported application. It will definitely flood your screen with various commercial advertisements that might not only burden your browsing activities, but also expose you to threats. Do not expect that you will be able to escape from them by changing the browser because this advertising-supported application is compatible with all of them. The only reliable method to get rid of SaveInShop Ads is to delete SaveInShop itself from the system. Do not worry if you are not sure how to do that – just continue reading the article. Even though SaveInShop might seem useful from the first sight because it is going to provide you with different kinds of deals, discounts, and coupons. The publishers of this program claim that you will be able to compare deals and prices of different items. Thus, you will be able to buy the cheapest products and thus save money. Unfortunately, not everything is so perfect about this application. The specialists of pcthreat.com have found out that this program might expose you to threats via all those advertisements; thus, we believe that there is no point in keeping it on the system. 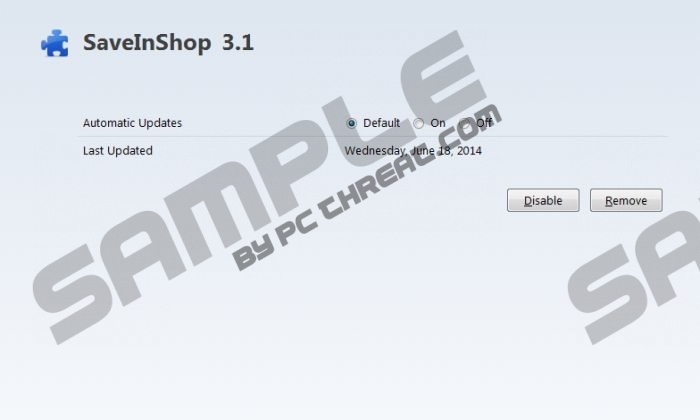 The removal of SaveInShop will also allow you to browse the web without any interruptions again. In order to display SaveInShop Ads on your screen, cookies and other tracking technologies collect data regarding your activities on the web. Thus, it is very likely that the websites which you visit, the search queries that you enter into the search box, your IP address, approximate location, and similar data is known for the publishers of SaveInShop. It is also very likely that all the collected data will be shared with third party advertisers as well. If you do not like the idea that somebody knows what you are doing on the web, you should get rid of SaveInShop as soon as possible. In order to get rid of SaveInShop Ads, you have to erase SaveInShop program from the system. Luckily, it is not a very difficult process because it can be removed via Control Panel. However, if it happens that you do not succeed for any reasons, you should definitely scan your system with a reliable antimalware scanner, for instance, SpyHunter. After the scan is complete, you will just have to click Fix Threats button and all the undesirable applications will be erased in a blink of an eye. Locate Control Panel on the list of applications. Right-click on the software that you are going to erase. Find SaveInShop on the list and select it. Quick & tested solution for SaveInShop Ads removal.